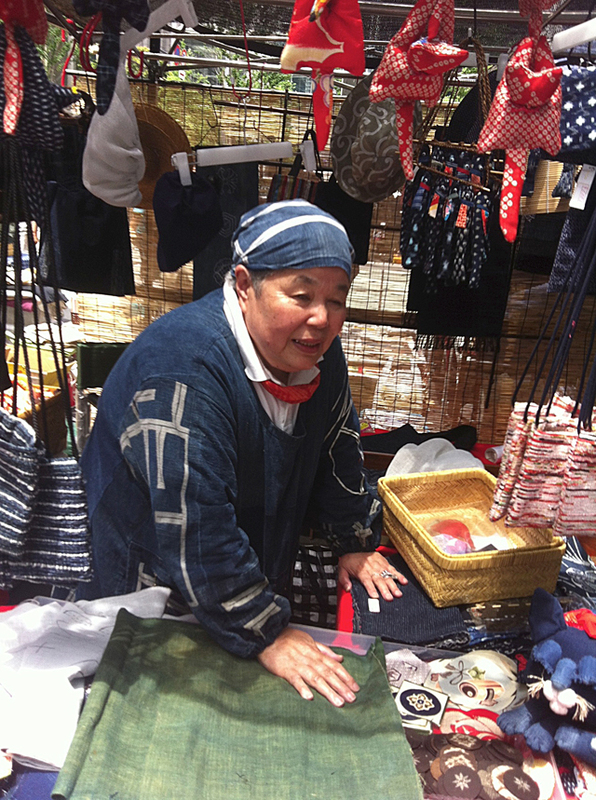 Sunshine at last broke through constant days of rainy season rain today, and bright blue skies blessed the OEdo Antique Market on the first Sunday of July, bringing out palpable enthusiasm and high wire fun. 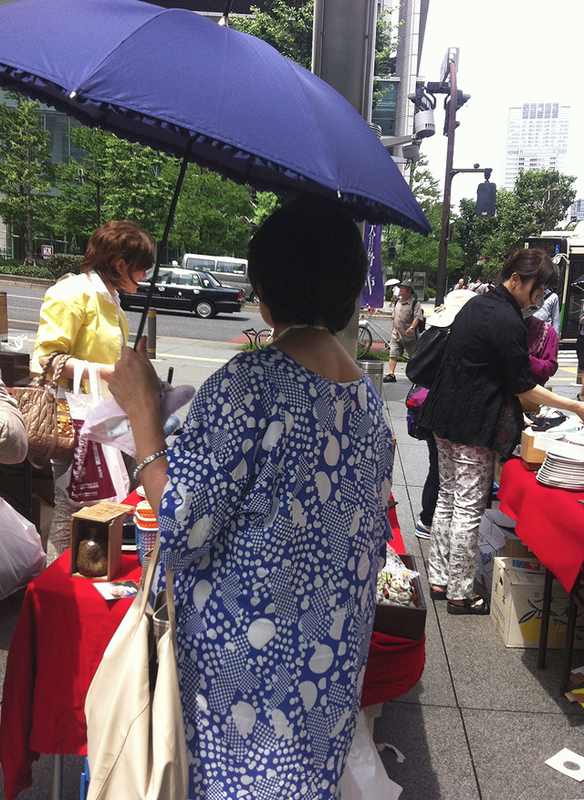 The crowd was lively and spiffy today after weeks and weeks of cancellations and rain coats and umbrella Sundays. 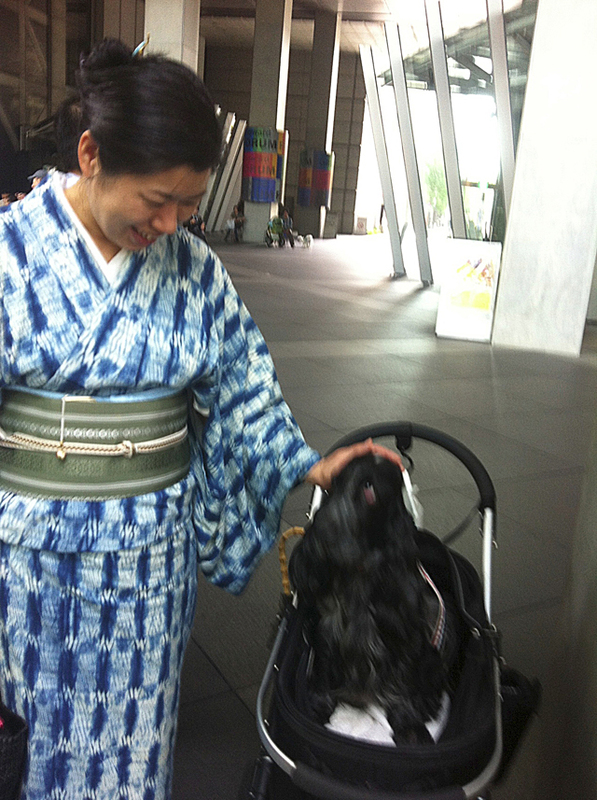 Tokyo International Forum played host to more than 200 plus dealers and probably 10 or 20 times more onlookers: strollers, browsers, enthusiasts. 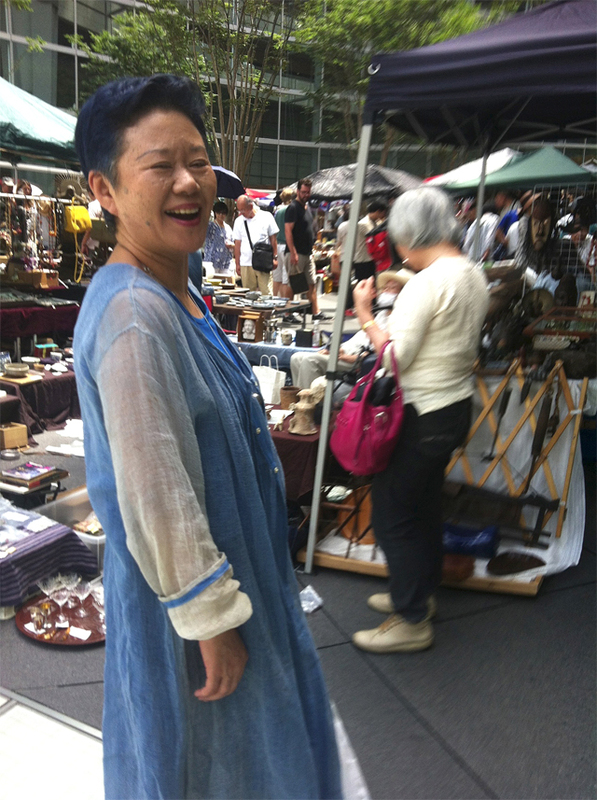 Today it was the customers and dealers who caught my eye today even more than the treasures spread out for them to buy. People had style. 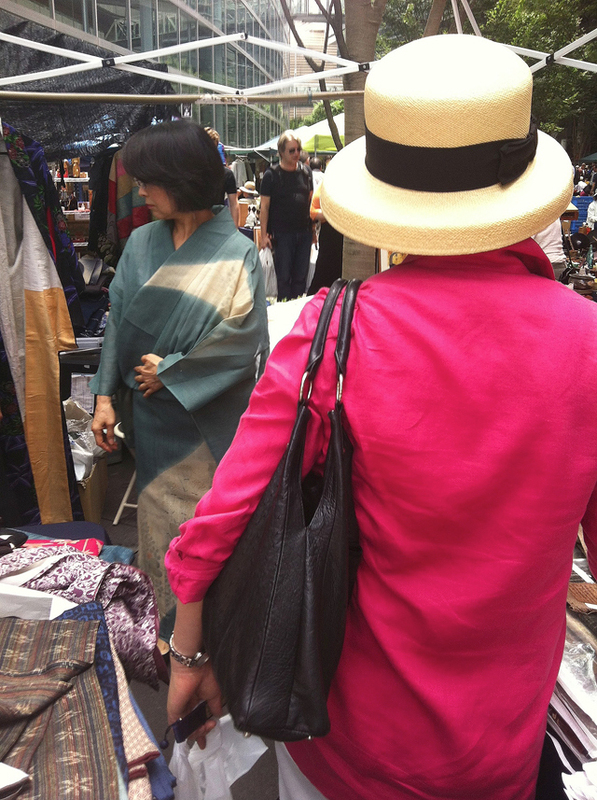 They had panache, and in many cases they were wearing finds from previous flea market forays. Most of all, they had a sense of dressing with flair. Standing up and being noticed may have been one of the reasons they came. I snapped away on my iphone without even being polite enough to ask permission – the poses were too fleeting, the moment was more a second and needed to be seized. But in every case, they smiled in response to my iphone intrusion, although sometimes I was so surreptitious that they didn’t even notice. Sometimes it is the dealers who dazzle. 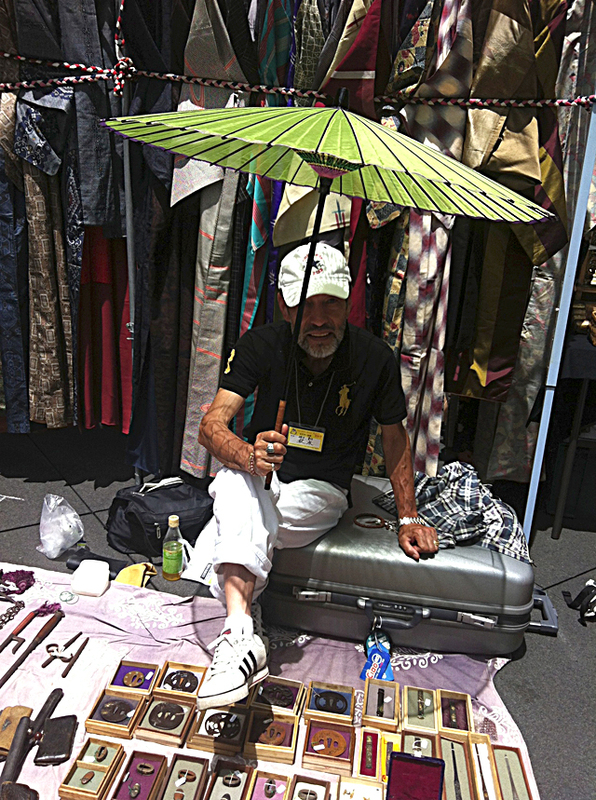 This man deals in Asian Textiles and is a walking billboard for his closet. 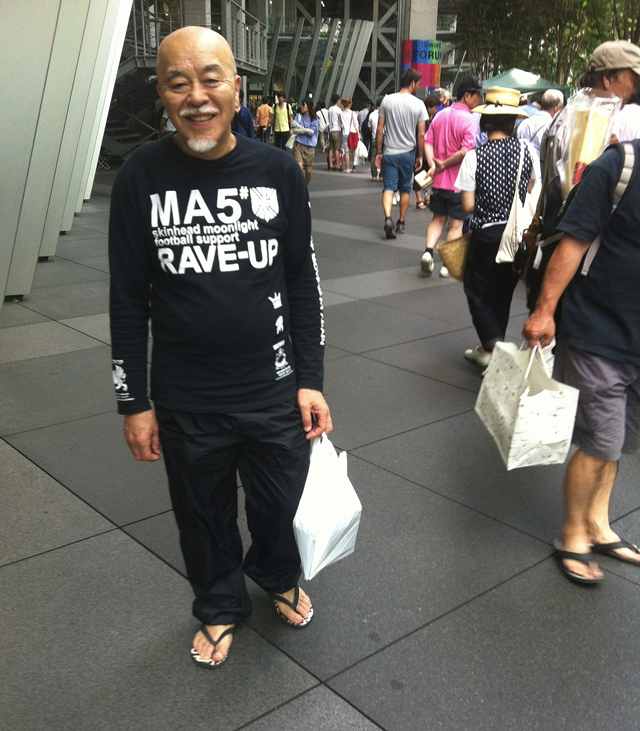 But when he wondered why I was taking photos, claiming he was just the same as everyone else, I disagreed and complimented his comfortable sense of style, his sense of self. He seemed genuinely surprised. Most of the photos need no comments. They speak for themselves. 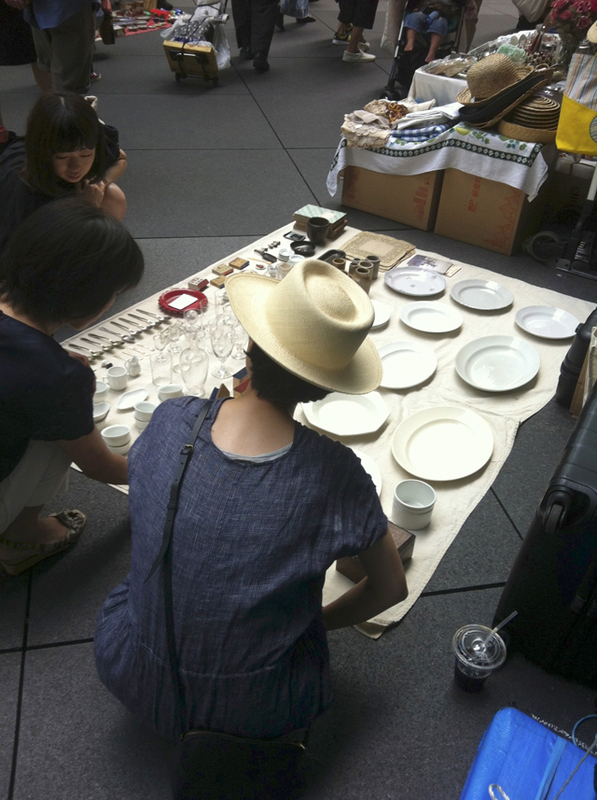 Surely I am prejudiced but I think Japanese flea markets excel for their exquisite – mostly – collections of beautifully handmade antiques, the history they explain, the extraordinary rendering of natural materials, and the artistic way in which they have been collected by each dealer and artfully set out for people to muse upon, be enticed by, inspired by. 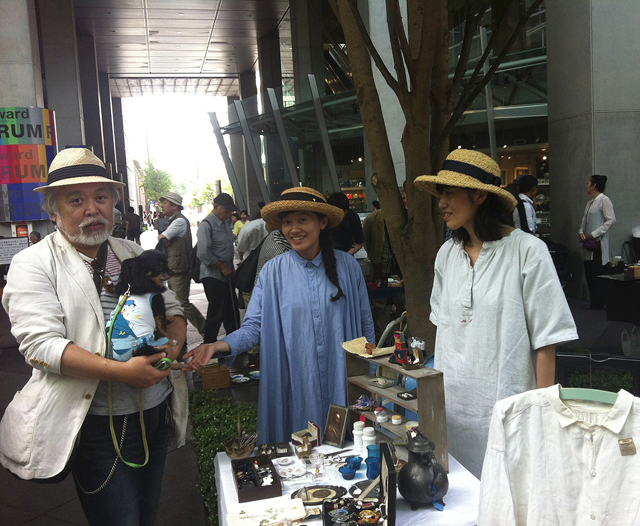 They are a social diary of Japan’s past. How people lived. What they lived with and worked with. The objects of living and working and playing are all there. There are objects of faith, what people believed in. 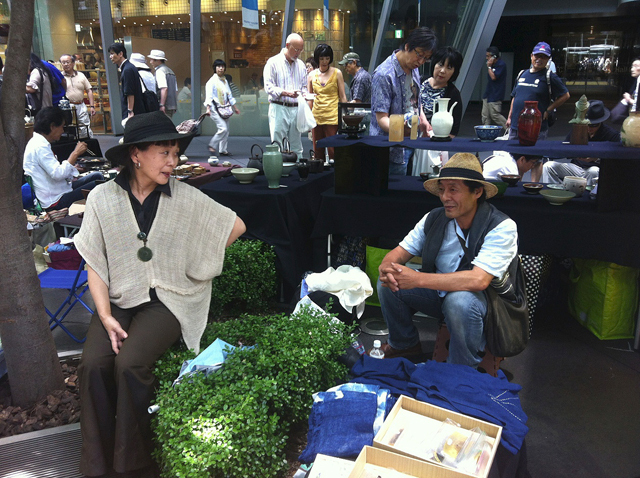 And what people are attracted by, including huge selections of antiques and art from other countries. 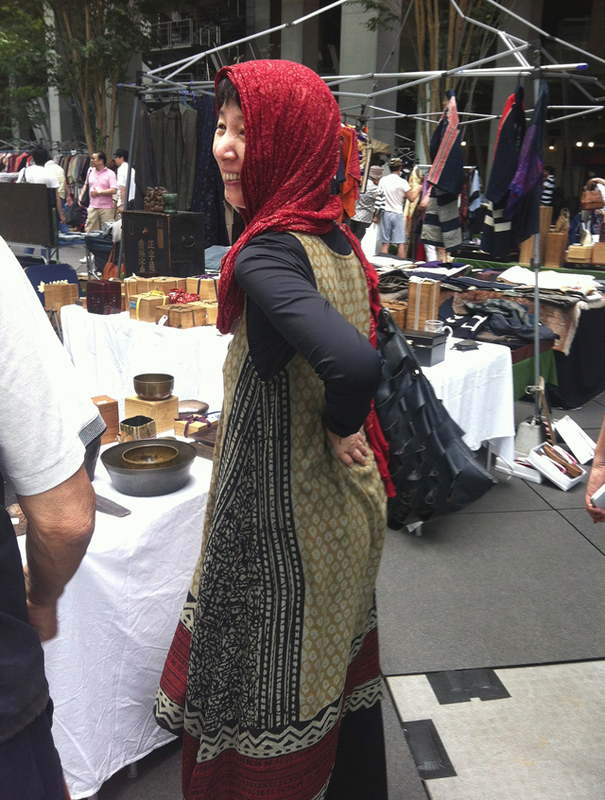 The market is a fascinating stew of what catches the eye and the imagination. It’s about learning from the tastes and fixations of others. Often it is the dealers who enchant me. 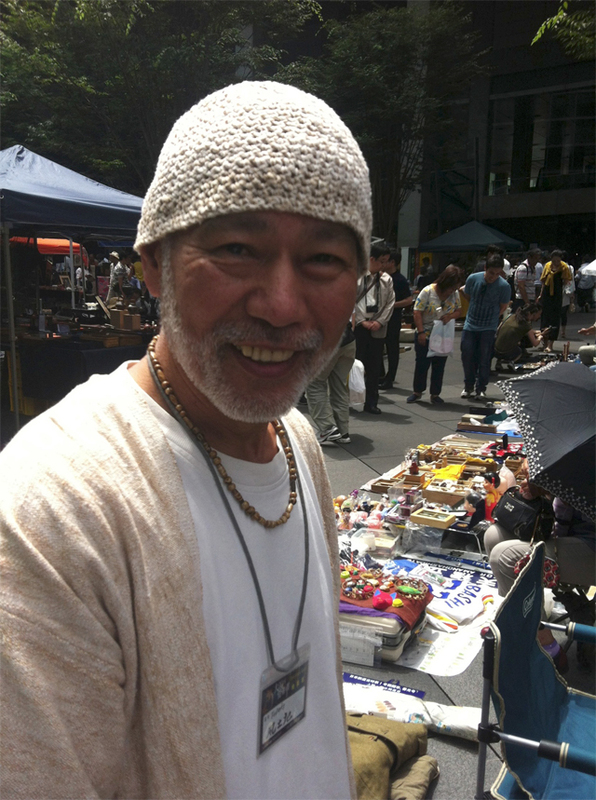 This man, recognizable by his signature jaunty hand knit skull cap worn in all seasons, drives 12 hours down from Yamagata twice a month, wondered where Basho was, my black dog who always joins my flea market adventures. Too hot, I told him. 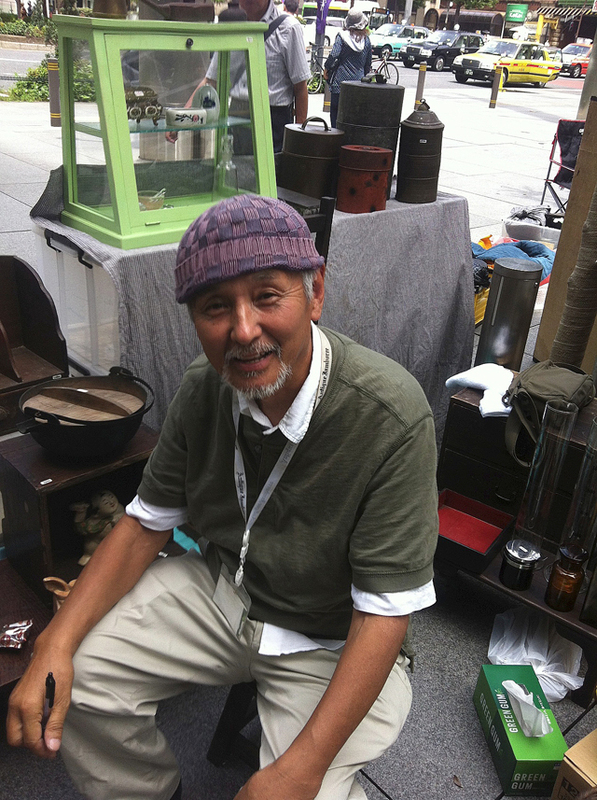 He brings tools and artifacts from the heart of Japan’s farmlands, its mountains, its deepest country traditions. The banter, the exchanges, the reassuring sense of connecting and sharing stories and knowledge and experience is a draw for dealers and customers alike. 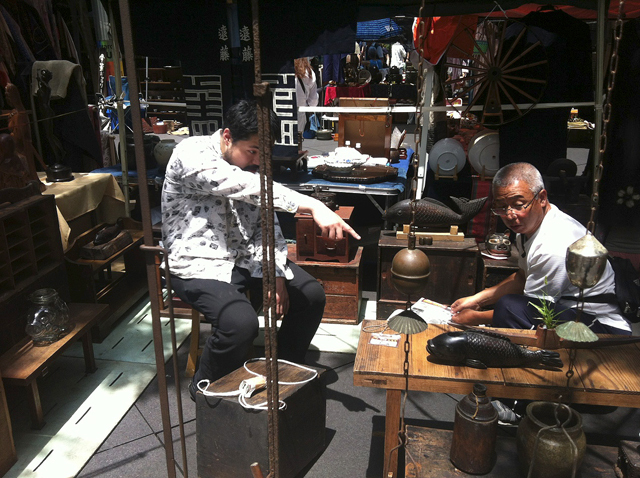 The Tokyo OEdo Antique market scene – everyone is welcome. 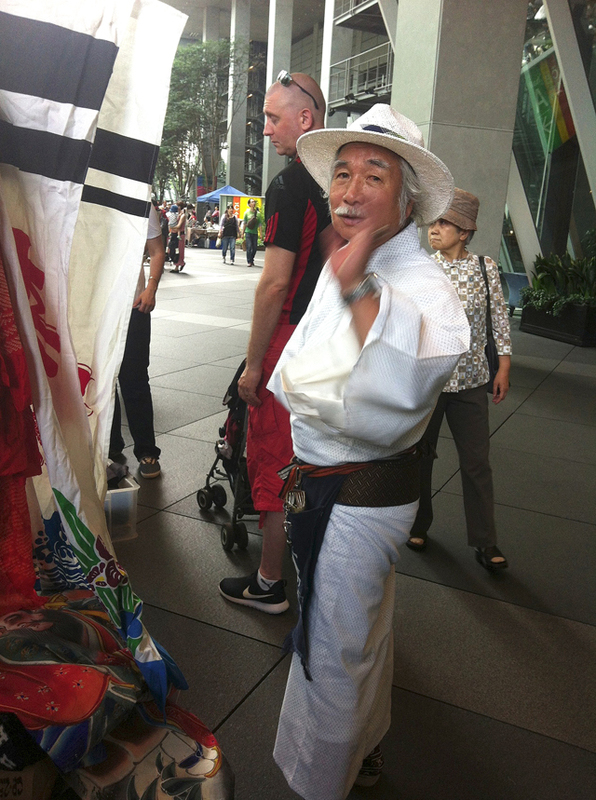 Old ways kindle new styles and everyone can step outside themselves and have a great time. 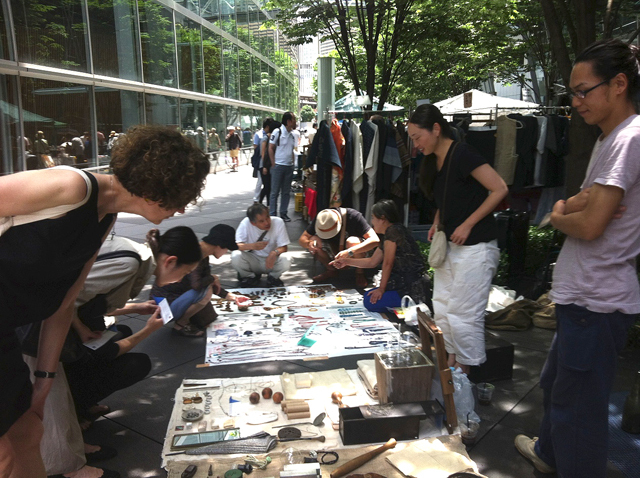 Held at Tokyo International Forum in Yurakucho, 1st and 3rd Sundays. One of my most favorite sites. Such good taste. Always a welcome surprise. Unsubscribe? Never. Much of it surprising ! Fabulous post! How I would love to visit! 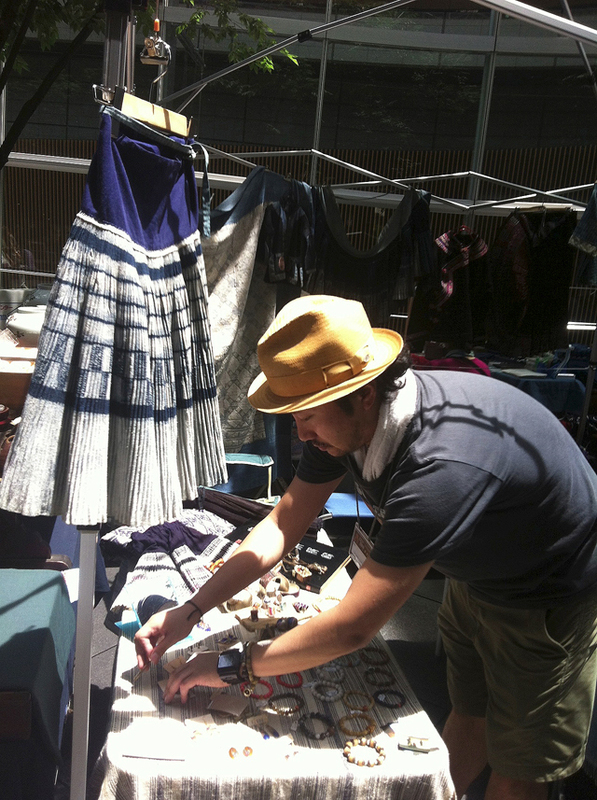 I love the Blue/White skirt hanging, and all the people you “befriended”. 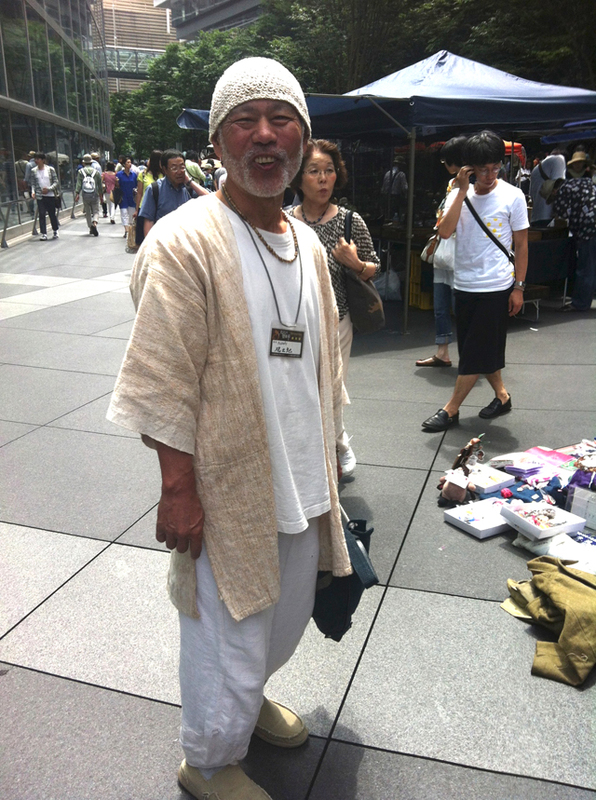 That first smiling man, dressed in white and matching flax-colored kimono, beanie hat, and shoes, is my favorite. 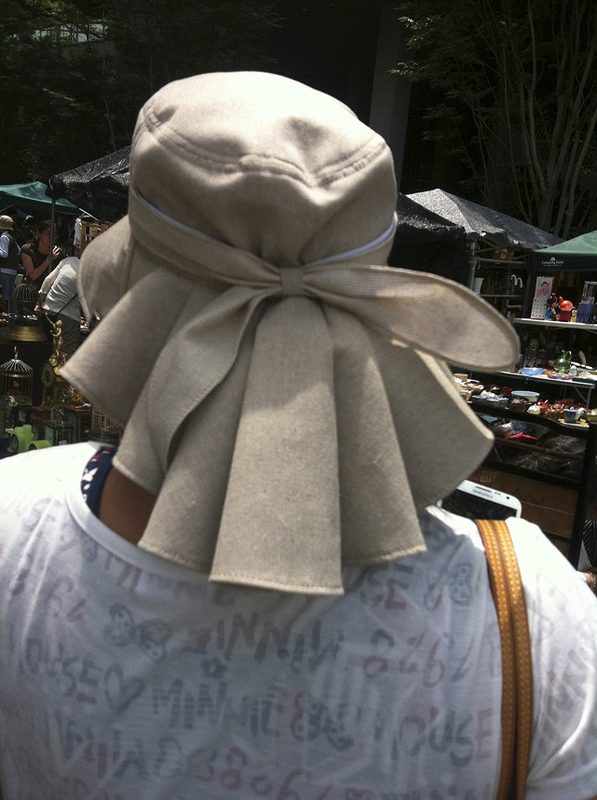 I wonder if this is his one summer “flea market outfit” or if he has other stylish combos. I love your posts and look forward to receiving each one! If I ever get over my dread of flying I will come and see all this beauty you send me in person. Until then, I will study your pictures and dream. A comment from you Deva is a reconnection that gives me courage. 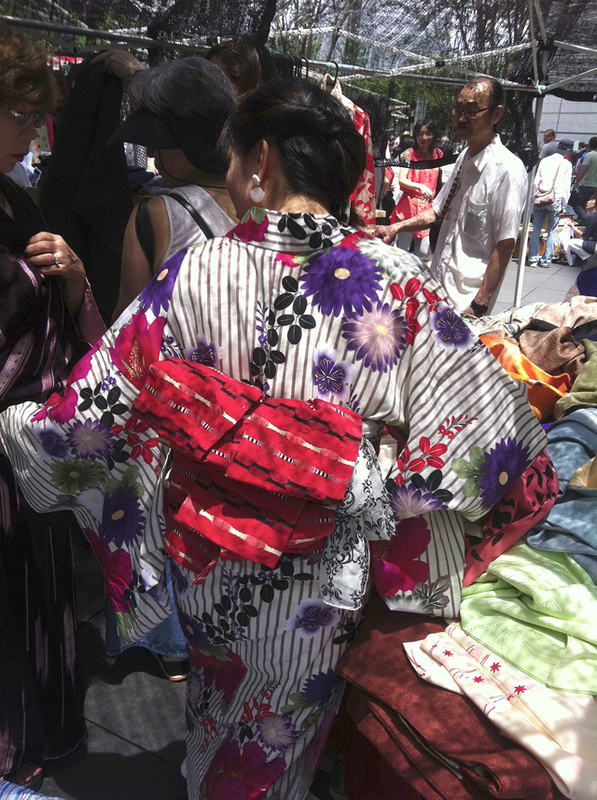 And yes, Japan is a treasure hunt – just that. Sorry I missed you last visit. Will not be so careless next time. Much as I love blue and white, the red/orange dress is stunning. Any idea of its origin? 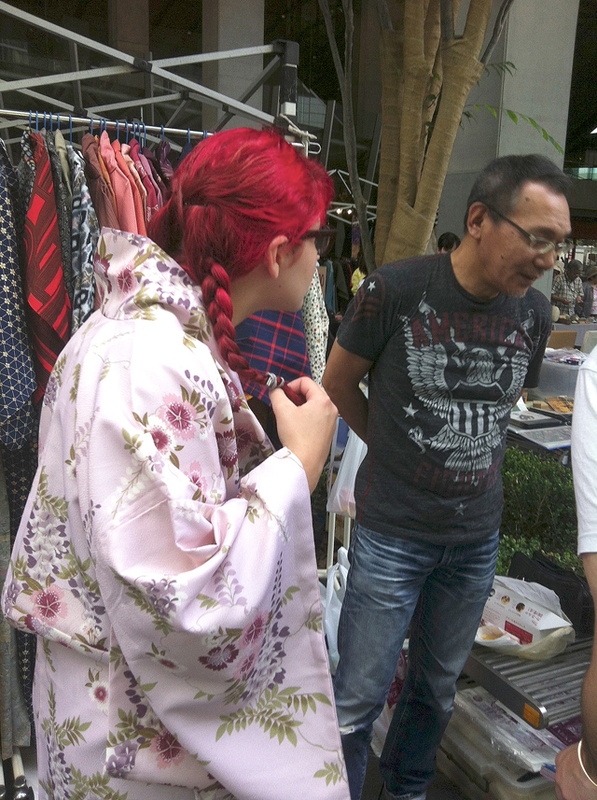 Glad I found your posts and I am so looking forward to visiting your store again in Oct. 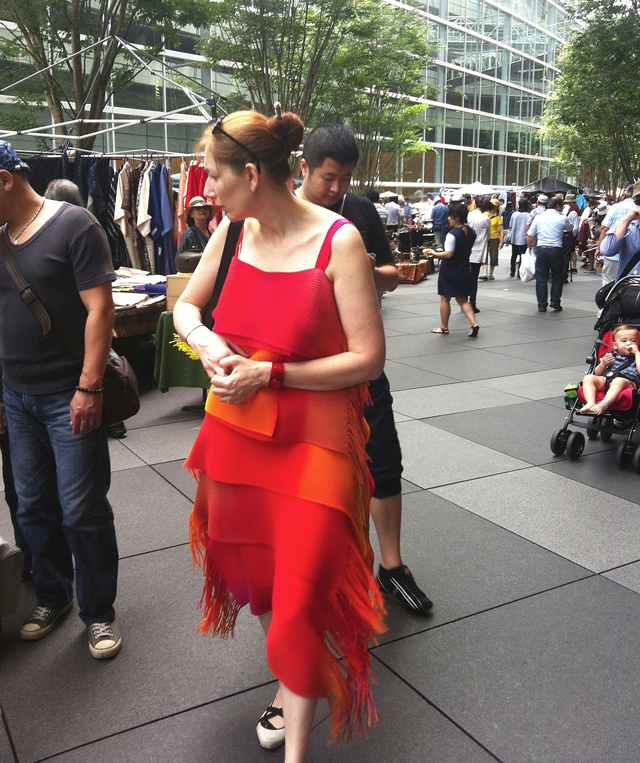 It looks like Issey Miyake’s PLEATS to me, though I didn’t have a chance to check the label. What a fantastic post of one of my favorite places! You are making me homesick Amy! I have big footsteps to follow in ! Glad you had your holiday. Looks fantastic. But also glad you are back in the saddle. How refreshing your take on life !